The important visit that in recent days the Deputy Foreign Minister Emanuela Del Re is conducting between Eritrea, Ethiopia and Djibouti testifies the newfound attention of our country for the Horn of Africa, already demonstrated with the previous trip of the premier Conte at the end of October. The Deputy Minister of Foreign Affairs and International Cooperation, Emanuela Del Re, has been visiting Eritrea since last Monday, where he visited the local Italian School and met with President Isaias Afewerki. The day before, Del Re inaugurated in the presence of Health Minister Amina Nurhussen the new cardiology department of the Orotta hospital in Asmara, built thanks to the Italian Cooperation funds. In fact, it is well-known that for some time there has been an important medical exchange between Italy and Eritrea, with Tuscan and Calabrian doctors going to the country of the Horn of Africa for the care of patients and the training of new staff. In the wake of these fundamental precedents, therefore, we can also do new and further things, aimed at further enriching the already historic links between the two lands. 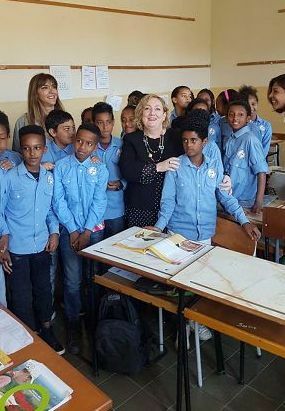 On the same day, the deputy minister also visited the Italian School of Asmara, the largest Italian school abroad along with that of Santiago de Chile, with no less than 1,200 students. In the visitation speech, he then rightly defined the Italian School of Asmara "a vehicle for dialogue and understanding between the two countries in the crucial phase of the history of the Horn of Africa with opportunities for collaboration and shared development". The reception of the students, from the smallest to the biggest, as well as that of all the teachers and the other school operators, has been enormously warm. This school testifies how Italian is a strongly felt language in Eritrea, where many know it and study it, even in other institutions. The fact that young people in Eritrea receive free professional training from the state, combined with the knowledge of Italian, is also a great incentive to invest for our entrepreneurs, who in this country know they can find young people already trained and who know their own language. All this, in the rest of the African continent, is not always guaranteed. On his first day in Eritrea, on the other hand, Del Re visited the Cheren cemetery, where in 1941 the final battle took place between the Italian and the allied troops. In that cemetery, a place not only of eternal rest but also of historical and collective memory, Italian soldiers and Eritrean Ascari are buried, who together fought and died with enormous value against the preponderant forces of the enemy. Today the deputy minister is going to Ethiopia, where he will meet the local authorities, the Committee of Italian Residents Abroad (Comites) and Italian entrepreneurs on site, as well as visit the Italian School of Addis Ababa, the Don Bosco School and the Institute for the development of the leather industry. His journey will then end in Djibouti, where he will visit the Italian military base that provides logistic support to the national contingents operating in the Horn of Africa and the Indian Ocean. Then he will visit the International Djibouti Fair (Dift), scheduled between 3 and 10 December, and will inaugurate a local branch of the ICE in Addis Ababa. Then he will return to Italy. The big difference with Conte's trip is that, this time, the deputy minister went first to Eritrea and then to the other countries, while at the end of October the premier had done the opposite. This is a very important recognition also for the key role that Eritrea is increasingly acquiring throughout Eastern Africa, as a real political and diplomatic crossroads between all the countries that are part of it and which are now proceeding with success and speed. in their shared and shared process of peace and regional integration, as well as for other countries such as Kenya, Sudan and South Sudan, which likewise intend to join and participate in it. Deputy Minister Emanuela Del Re at the Italian School of Asmara.